Sport for development (SFD) research has evolved over the last 15 years—moving beyond simply mapping the territory (Levermore & Beacom, 2012), to include studies in program design, sustainable development and capacity building, creating and leveraging impacts, and theoretical advancements in the field (Schulenkorf, 2017). In their integrated literature review, Schulenkorf, Sherry, and Rowe (2016) noted the leading outlets for SFD research at the time were Sport in Society and the International Review for the Sociology of Sport, suggesting researchers’ (and readers’) interests in the social aspects of SFD. However, more often “academics are now analysing the specific management and organisational aspects of SFD projects, including the specific tactics, strategies, and implications of sport related development work” (Schulenkorf, 2017, p. 245). For example, Svensson and Hambrick (2016) identified critical elements of organizational capacity at a small North American SFD organization with operations in East Africa. Svensson, Hancock, and Hums (2017) also uncovered critical elements of organizational capacity for SFD by interviewing leaders from 29 North American-based SFD organizations operating in urban (densely populated) settings. In these two studies, researchers utilized Hall et al.’s (2003) multidimensional framework for nonprofit organizational capacity to identify context-specific elements within broad capacity dimensions that enable SFD organizations to achieve their goals. The framework contends that critical elements of organizational capacity are context specific and fall under the broader dimensions of capacity— including human resources, financial, relationship and network, infrastructure and process, and planning and development capacity. In the current study, we utilize Hall et al.’s (2003) framework to guide our investigation of capacity for domestic SFD in Canada. Specifically, building on existing literature in community sport (Doherty, Misener, & Cuskelly, 2014; Misener & Doherty, 2009; Sharpe, 2006), and extending research in the SFD context (Svensson & Hambrick, 2016; Svensson et al., 2017), the purpose of this study was to uncover the critical elements of organizational capacity for domestic SFD within the dimensions of human resources, finances, external relationships and networks, infrastructure and processes, and planning and development. In this study, we use the term “domestic SFD organization” to refer to community organizations that deliver SFD programs and initiatives that are designed to meet the needs of their communities. Domestic SFD programs are implemented by people from the community and include “sport-plus” initiatives that add social development goals to traditional sport programs, and “plus-sport” initiatives that use sport to attract participants to education-first programs (Coalter, 2010). Domestic SFD organizations in this study include social service agencies, sport clubs, charities, and foundations with at least part of their mandate to achieve community development and social change through sport. Domestic SFD organizations may work independently or be affiliated with a national partner/umbrella organization (MacIntosh, Arellano, & Forneris, 2016; Svensson et al., 2017). However, regardless of any structural variations, they share a mission to improve local communities by addressing local issues. In this context, community development includes promoting education and postsecondary enrollment, increasing awareness for mental health services, developing leadership and other life skills, improving new immigrant and refugee integration, improving police-to-community relations, and making inclusive and accessible sport options available to underserved and at-risk youth. These community-focused SFD outcomes align with Guest’s view that SFD programs “simply [provide] the social space for communities to enact their own versions of healthy and positive development” (2009, p. 1347). However, empirical research focusing on the organizational aspects of SFD remains scarce (Schulenkorf, 2017; Svensson et al., 2017). Thus, this study aims to deepen and extend our understanding of these aspects. With greater insight into the critical factors of capacity for domestic SFD, scholars and key stakeholders including government agencies and private donors that provide funding for these groups and their programs, may be better positioned to support these organizations to achieve their domestic SFD goals. Research has explored the critical elements of capacity in the community sport and SFD contexts. Beginning with local grassroots sports clubs, Sharpe (2006), Misener and Doherty (2009), and Doherty et al. (2014), uncovered particular elements within the dimensions of Hall et al.’s (2003) framework that represent the key strengths and challenges experienced by these organizations. Collectively, these studies identified the critical elements of sport clubs’ capacity for goal achievement: sufficient, continuing, enthusiastic, and skilled volunteers who have a common focus for, and are supported by, the organization; stable revenues and expenses, alternative sources of funding and fiscal responsibility; effective communication, formalization, and adequate facilities; creative strategic planning and implementation; and effective relationship management characterized by engaged, dependable, and balanced partnerships. Following the work of Doherty and colleagues (2014; Misener & Doherty, 2009), Svensson and Hambrick (2016) and Svensson et al. (2017) explored the nature of capacity for SFD. Unlike membership-based community sport organizations (CSOs), SFD organizations (generally) do not have paying members. As a result, they “face considerable challenges in fund development, volunteer recruitment, and staffing” (Svensson et al., 2017, p. 4). Svensson and Hambrick (2016) uncovered critical elements within a North American-based SFD organization that operates its programs in a developing country. Their interviews were conducted with North American staff, and thus the focus is limited to the host organization, rather than the domestic SFD delivery unit. Critical elements uncovered in Svensson and Hambrick’s (2016) study include: paid staff and sufficient engaged, knowledgeable volunteers with shared values; sufficient and sustainable funding from a variety of sources, including fundraising; formalized organizational structure; critical, self-reflective, strategic planning and sustained implementation; and mutually respectful, collaborative partnerships. Svensson et al. (2017) focused on the capacity of North American-based organizations that are members in a national coalition of SFD institutions operating within large metropolitan areas in the United States. They found that the critical elements of capacity of those SFD organizations were: paid staff and engaged personnel; sufficient revenues, particularly large-scale funding, and budget management; formalization, access to facilities, technology, and an informal, flexible organizational culture; strategic planning and implementation; and balanced, aligned relationships with a variety of external partners. There are many parallels and some unique features of organizational capacity in the community sport and SFD contexts, supporting the notion that a “one size” capacity framework does not fit all. Moreover, “the manner in which organizations implement SDP programmes can positively or negatively impact learning outcomes” (Svensson et al., 2017, p. 10), so uncovering the specific capacity elements that contribute to successful SFD programs may be especially important in this context. Thus, prompted by the rich and growing body of research examining organizational capacity for SFD, the current study contributes to the literature by broadening its investigation to consider a range of domestic SFD organizations that offer programs in diverse settings. Further, this study examines plus-sport and sport-plus programs that are being implemented using a variety of sports (n=10) that represent the breadth of domestic SFD initiatives. This study extends knowledge and understanding of the critical capacity elements in this context, providing a stronger platform to support and build capacity for domestic SFD. With the growing focus on management considerations for SFD, a number of studies have examined factors that influence program delivery and organizational sustainability that resonate with the capacity dimensions in the Hall et al. (2003) framework. Research and conceptual reflections corroborate the importance of certain dimensions and elements in the capacity of SFD organizations across a variety of contexts. An indicative, although not exhaustive, review of that literature is presented here. As is the case with the consideration of capacity in community sport organizations (Doherty et al., 2014), the greatest attention has been given to human resources and partnerships in SFD organizations. Corresponding with human resources capacity, SFD researchers have considered and identified sufficient volunteers and paid staff (Casey, Payne, & Eime, 2012; Spaaij, 2013), important characteristics (e.g., leadership style, motives, skills) of staff and volunteers (Spaaij, 2013; Wells & Welty Peachey, 2016; Welty Peachey, Musser, & Shin, 2017), and shared values (MacIntosh & Spence, 2012) as critical to achieve SFD outcomes in a variety of contexts. With respect to external relationships capacity, the focus has been on mutual or shared understanding by both parties regarding goals and values associated with SFD (Spaaij, 2013), effective communication between partners (Giulianotti, 2011; Hayhurst & Frisby, 2010), and engaged partnerships characterized by collaboration (MacIntosh et al., 2016; Meir, 2017; Schulenkorf, 2012; Skinner, Zakus, & Cowell, 2008; Thomson, Darcy, & Pearce, 2010). Relatively less consideration has been given to financial, infrastructure, or planning capacity. Related work has considered long-term financial sustainability (Casey et al., 2012; Giulianotti, 2011; Thomson et al., 2010), alternative funding sources (Spaaij, 2013), formalization (Casey et al., 2012), access to facilities (Welty Peachey, Borland, Lobpries, & Cohen, 2015), monitoring and evaluation (Sanders, 2016), and strategic planning (Giulianotti, 2011; Skinner et al., 2008) as critical to SFD goal achievement. Together, these and other studies (Rosso & McGrath, 2017; Schulenkorf & Edwards, 2012; Sherry, Schulenkorf, & Chalip, 2015; Svensson, Andersson, & Faulk, 2018; Svensson & Seifried, 2017; Welty Peachey & Burton, 2017) indicate a movement in SFD scholarship toward “a focus on management [that] shifts the emphasis from merely investigating specific programme contexts or impacts to factors involved in strategically designing, managing, and leveraging SFD initiatives” (Schulenkorf, 2017, p. 245). As part of this new management movement in SFD scholarship, and with a focus on better understanding and ultimately strengthening these organizations, this study addresses the research question: Within the dimensions of human resources, finances, external relationships and networks, infrastructure and process, and planning and development, what are the critical elements of capacity for domestic SFD goal achievement? A total of 17 organizations representing a diversity of organizational structures, locations, and mandates that reflect domestic SFD agreed to participate in this study. Organizations were from across Canada, with a majority operating in or close to major cities (Toronto, Ottawa, and Vancouver). Participating organizations ranged from small kitchen-table structures to fully developed social service providers with multimillion dollar annual budgets and networks of resources and mandates beyond SFD. Yet they nonetheless share a mandate to offer programs that focus on the development of individuals and their communities through participation in sporting activities. The development focus of the respective sport programs include: promoting education and pathways to postsecondary education; mentoring programs designed to steer at-risk youth away from violence and gang affiliation; suicide and mental health awareness; new immigrant and refugee integration; and facilitating positive police-to-community relationships. The sample also represents a wide variety of sports (n=10) through which these objectives are delivered. Further, and following Coalter (2010), we classified the organizations as offering plus-sport programs (n=7) based on their delivery of development/training/education-first initiatives where sport is used to attract young people, and sport-plus initiatives (n=10) where sport-first programs were adapted to achieve SFD goals. Interviews were conducted with an individual in each organization involved in a key role with respect to the coordination and/or delivery of the SFD program. The interviewee and the organization/program (both pseudonyms), the individual’s role in the organization, the sport activity, and the SFD approach taken are indicated in Table 1. A semistructured interview methodology following Patton (2015), was utilized to explore the critical elements of capacity within the focal context. The sample was generated based on a search of publicly available information on the Internet that identified organizations that were implementing a domestic SFD program. Without compromising the anonymity of the sample, a Google search for “sport for development + Canada” reveals similarly focused organizations, government agencies that support domestic SFD, and private donors/philanthropists working in domestic SFD as well. Key representatives (e.g., executive directors, program coordinators) from 33 organizations were contacted via email with a letter of information and an invitation to participate in a research study. A follow-up phone call was placed one week later to determine the interest and willingness of the representative to contribute to the study. Ultimately, 17 representatives from 17 domestic SFD organizations participated. 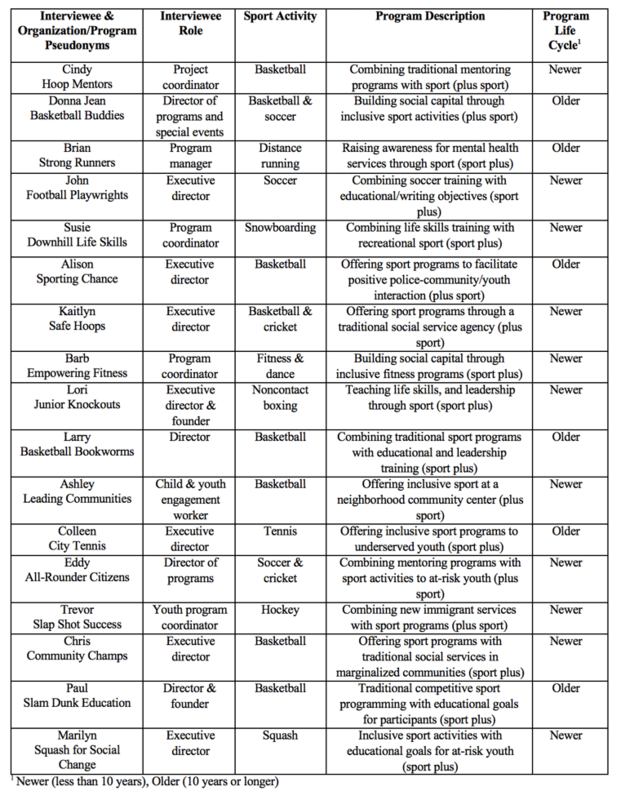 Following an interview guide based on Doherty et al.’s (2014) capacity research in community sport, participants were asked to identify particular strengths and challenges in the delivery of SFD programming within their organization, with respect to each of Hall et al.’s (2003) five capacity dimensions. The strengths and challenges indicated by participants—the greatest assets and greatest deficits to achieving their domestic SFD goals—represent the critical capacity elements for the organizations (Doherty et al., 2014). For example, participants were asked “what are the critical planning and development strengths of your organization? And what are the critical challenges?” The semistructured, conversational nature of the interviews also probed for examples and allowed for follow-up questions and points of clarification that resulted in a “thick description” (Lincoln & Guba, 1985, p. 328) of capacity in these organizations. The interviews lasted between 45 and 75 minutes and were conducted by phone (n=16) and in-person (n=1) by the study’s first author. The interviews were audio-recorded and transcribed verbatim, removing all organization names and personal identifiers to protect the anonymity of the organizations and the interviewees. Once the transcripts were complete, and for the purpose of member-checking that also helps to establish the trustworthiness of the data (Patton, 2015), transcripts were sent to participants to review their own statements for clarity and to ensure the transcripts matched their true perspectives and experiences. A priori coding of the transcripts followed the five dimensions of Hall et al.’s (2003) framework, categorizing first by identified strengths and challenges within each dimension. Emergent coding for subthemes within each dimension, accounting for strengths and challenges as representative of critical factors, was then undertaken. The emergent coding scheme developed over time, with new subtheme codes agreed to and applied with each transcript until the coauthors agreed the codes were accurate and were represented and applied uniformly across each of the 17 transcripts. For example, with respect to human resources capacity strengths, the emergent codes included 3.1.1 passion, 3.1.1.1 passion for helping others, and 3.1.1.2 passion for the sport. Ultimately, codes 3.1.1, 3.1.1.1, and 3.1.1.2, were merged to capture the theme/critical human resources capacity element “passion.” Further, and to ensure the trustworthiness of the findings (Lincoln & Guba, 1985; Patton; 2015), the coauthors reviewed each transcript independently and then reviewed each other’s coding in a series of back-and-forth exchanges and meetings until the interpretation and application of each a priori and emergent code was agreed upon. Although the sample represents a range of organizations offering different sports and sport-plus/plus-sport programs, the purpose of this study was to identify patterns of common themes and subthemes across these domestic SFD organizations. Nonetheless, it was of interest to consider whether there was any variation by life cycle of the SFD program or initiative in the respective organizations. Critical elements of capacity may vary depending on how long the organization has offered its SFD programming, either as the primary reason for its existence or as part of a larger social and/or sport mandate (Svensson et al., 2018). As indicated in Table 1, the organizations were categorized by whether their programming was “newer” (less than 10 years) or “older” (10 years or more). A total of 11 organizations offered newer SFD programs at the time of the study (range 1-7 years, average 3 years), while six organizations offered older, more established programs (range 10-25 years, average 16 years). Multiple critical elements were identified within each of the five dimensions of organizational capacity (see Table 2). The findings are presented here, along with a sample of quotations that are indicative and representative of these elements in the domestic SFD context. These quotations include examples of both strengths and challenges that illustrate the importance of the particular elements. The findings coincide with existing research on capacity in CSOs (Doherty et al., 2014; Misener & Doherty, 2009; Sharpe, 2006) and SFD organizations (Svensson & Hambrick, 2016; Svensson et al., 2017), and provide new insights to critical elements in the domestic SFD context. As such, this study extends organizational capacity theorizing by advancing a refined framework of critical elements specific to domestic SFD, while providing a platform for the further examination and management of organizational capacity in this context. The critical elements are presented and discussed in relation to existing knowledge while highlighting new and unique findings. Critical elements of human resources capacity that impact the ability of organizations to achieve their domestic SFD mandates were indicated as: (a) passion for helping others and for the sport itself, (b) familiarity with development issues, (c) valued skills and competencies, (d) active and engaged volunteers, (e) sufficient staff, (f) administrative help from volunteers, (g) training and support from the organization, and (h) shared vision. Of those critical elements, several are consistent with what has been uncovered in research on SFD capacity. We recruited from the community or similar communities as our youth. The workers, the volunteers, the leaders have an experience [that is] similar in terms of their growing up to the youth that they’re working with, and that seems to be pretty important for them to develop that relationship. Whereas skills and experience pertaining to the sport or the club itself are valued in CSOs (Doherty et al., 2014; Wicker & Breuer, 2011), domestic SFD programs appear to rely on an understanding of the specific needs of the participants and communities they serve. Svensson et al. (2017) similarly identified the importance of recruiting former participants as volunteers because “they easily related to the program participants” (p. 15). However, neither Svensson et al. (2017) nor this study’s authors interviewed SFD alumni staff or volunteers. Future research may explore how SFD alumni improve communication, build trust, and impact domestic SFD organizations and their participants. Further, this finding may have implications for recruiting, as research suggests SFD volunteers may be interested in “exposing oneself to new cultures and becoming better world citizens” (Welty Peachey et al., 2017, p. 4), influenced by their love of sport (Welty Peachey, Cohen, Borland, & Lyras, 2013). While these characteristics are laudable, the current study’s findings suggest it is just as, or more important, that domestic SFD volunteers and staff have knowledge and experiences from the communities they serve. However, familiarity with SFD issues was identified as a critical element for relatively fewer older domestic SFD programs. This may be because more established programs have evolved to a stronger and clearer sense of their unique needs and thus are less dependent on volunteers and staff having had direct experience in that context. We do have a well-established board of directors and they have a lot of expertise in their areas of work. So, for example, we have a principal, [and] somebody from the education department, . . . and we have a couple CFOs on our board as well. Consistent with other research (Doherty et al., 2014; Svensson & Hambrick, 2016; Svensson et al., 2017), active and engaged volunteers were described as hardworking people who turn passion into action and are critical to domestic SFD delivery. They go above and beyond to positively impact participants’ experiences, and they are “the most experienced, hard working group of people you’ll ever meet” (Donna Jean, Basketball Buddies). At Sporting Chance—a police-to-youth initiative—“it’s all officer driven, right. So, they’re our volunteers . . . we advise them of the opportunity, but they’re the ones who actually decide whether to do it, and most of the officers do it off-duty . . . [they’re] exceptional volunteers!” (Alison). Active and engaged volunteers appeared to be critical to more established programs. While the reason for this was not explored in the current study, it may be that longer running programs are feeling the effects of volunteer fatigue (Lockhart, 2007) and are thus particularly dependent on volunteers who are meaningfully involved. I mean, one of the challenges is I’m the only person working on this. I’m the only coordinator working on this program. So, in terms of actual capacity, I’m running four different sport programs and I’m trying to plan these events and I’m trying to apply to grants. So, looking to the future it’s really dependent on [whether] I have time to continue applying to grants. Eddy described his organization’s challenge with insufficient staff, noting the growing wait list for their programs. At All-Rounder Citizens, “we have a lot of kids that are waiting . . . almost 400 kids. . . . I’m down to one social worker as well, so, those are the challenges we have” (Eddy). One of the parents has taken on all the registration and database so we can become so much more organized. We have another parent who [has] just taken on the role of tournament facilitator . . . and he’s taken care of all of that—again, on a volunteer basis. Interestingly, although both volunteers and staff are indicated in the current study and in previous research (Casey et al., 2012; Spaaij, 2013; Svensson & Hambrick, 2016; Svensson et al., 2017), there is a discernable focus in the current study on sufficient staff, who are viewed as carrying out the fundamental work of maintaining the organization and its programs and also managing the volunteers. Volunteers, in turn, are relied on to offer administrative support to the staff; thus, reinforcing the value of volunteers although largely in the context of assisting staff. Whereas Svensson et al. (2017) highlighted the importance of SFD organizations “finding roles and tailoring responsibilities to the needs and skill sets of individual staff members or volunteers” (p. 14), the current study highlights domestic SFD organizations’ reliance on volunteers taking on administrative roles in particular. Thus, the current findings suggest a human resources model that focuses on the critical work of paid staff and volunteers supporting that. Nonetheless, some variation was observed. Relatively fewer organizations with older SFD programs identified sufficient staff as a concern, yet relatively more of these organizations noted their reliance on administrative help from volunteers. With more established programs, these organizations may have settled in to operating with the number of staff they have and thus acknowledge the importance of volunteers pitching in. Consistently, relatively fewer organizations with newer SFD programs indicated relying on volunteers for administrative help. As they are generally in the early stages of building their programs these organizations may be less likely to delegate administrative tasks to volunteers. Training and support has not previously been identified in the domestic SFD literature and the focus here is ensuring personnel are familiar with both the sport activity and relevant development approaches and strategies. Training was described as formal or informal and comprising mentoring from leaders within the organization and guidance from the national or provincial sport organization. This is a social services agency that’s trying to deliver a sport and recreation program . . . like I’m coming at this from a phys-ed background, and everyone is coming at it from a social work or an education background . . . [and] people with a social work background are really wanting to emphasize the mentorship component. Well, I’m coming at it from a sport background and I really want to emphasize the sport component. So, I think that’s an organizational challenge. The current study helps to refine understanding of the critical elements of human resources capacity in domestic SFD organizations by reinforcing the importance of several factors that have also been identified in previous literature, while uncovering new and more nuanced elements (familiarity with development issues; particular skills and competencies that are valued; the importance of active and engaged volunteers, volunteers providing administrative assistance, and sufficient staff in programs at different stages of their life cycle; and personnel training for both sport and development). Four critical elements of financial capacity for domestic SFD organizations were indicated by interviewees. The elements uncovered are: (a) fundraising success, (b) grant funding success, (c) fiscal responsibility, and (d) sustainable funding. In Svensson et al. (2017), and Svensson and Hambrick’s (2016) research, similar elements were identified as revenue generation, fundraising, financial management, and the creation of a sustainable funding model. Although no new elements were uncovered in the current study, new insights into additional nuances of these elements were indicated. Thus, financial capacity is not just about securing grant funding, but the ability to apply for and manage this particular form of revenue. Hall et al. (2003) noted such challenges for the nonprofit sector in general, and the current study highlights their particular relevance in the domestic SFD context. Fiscal responsibility, or financial management (Svensson et al., 2017), described as careful budgeting and management of existing funds, was also identified as critical to domestic SFD organizations in this study—for the organization and its reputation. Donna Jean indicated, “when you donate [to us], you know your money is going to go a lot further than your expectations . . . we’re not wasting.” Paul put it this way: “we’ve been really cheap—which is good. Any sort of big purchase we all debate [it]. Everybody on the board gets to sit down and say ‘do we really need this?’” This likely reflects both the nonprofit status of organizations delivering domestic SFD and the expectation to be frugal. Given SFD organizations cannot rely on earned income from membership or participation fees to cover the costs of programming (Svensson et al., 2017), they instead have a primary focus on generating and managing funds responsibly to ensure their survival. Notably, relatively fewer organizations with newer domestic SFD programming identified fiscal responsibility as a critical factor, which may be a function of their relatively less complex budgeting (so far) or a focus on simply generating funds as they grow. However, that perspective may be problematic as organizations with older, sustained programs may be the ones that focused effectively on fiscal responsibility from the start. Indeed, Svensson et al. (2018) found that financial capacity was more likely to be problematic for sport for development and peace (SFDP) organizations at the start-up and growth stages. So, with the funding we have now, I think we have a two or three-year plan. But we’re hoping that be exceeding [at] this program we can gather more funding and write more proposals and attract more potential donors, because [now] we can display what we’re doing. It’s not an idea anymore. It’s actually tangible, and [donors] can see what’s happening. We just need to keep this going . . . [but] will we get the funding to do it? The work we do with young people, being in sport or physical activity—it’s about relationship building. And it takes time to build trust with the young person and break down the barriers and the walls they put up. And there’s this idea of 12- to 18-month programs that start and stop and the funding only comes for this amount of time . . . [and that] isn’t what’s most beneficial. Sustainable funding was seen as critical to maintaining and continuing to build trust that is seen to be fundamental to domestic SFD programs. The further insights to financial capacity uncovered in this study—namely, capacity challenges associated with grant funding, the importance of fiscal responsibility according to program life cycle, and sustainable funding for continuing program trust—advance our understanding of this dimension of the organizational capacity framework specific to domestic SFD. Four critical elements emerged within the external relationship and network capacity dimension. Interviewees identified: (a) engaged partners, (b) sustained partnerships, (c) social capital, and (d) time to manage partnerships as the critical elements impacting their ability to achieve social change in their communities. We’re in partnership with our provincial soccer association as well. [We] asked them to come and help us do soccer coaching workshops . . . [and] it helps us to train our coaches so they are competent when they lead soccer practices. At Squash for Social Change, Marilyn described their partnership with a private tutoring company: “We work with [them and] they help us getting our students assessed when they come in in grade six—knowing exactly what reading and writing and math levels they’re at.” Critical in these attentive, interactive, and collaborative partnerships is shared values and mission alignment (Svensson et al., 2017). I don’t always feel that it’s truly sincere. Like, some people do collaborate because that’s the only way to get the money, but as soon as it’s done they’re going to go their separate ways. But we don’t really look at it like that. We’re trying to build long-term relationships and we want to be a charity that’s around. We want to create a legacy! Moreover, sustained partnerships may be seen as critical because the time to pursue new partners can be a substantial burden on the limited human and financial resources of the organization (Gazley & Abner, 2014; Svensson et al., 2017). This may explain, in part, why it was further observed that sustained partnerships were indicated by relatively more organizations with newer programs that are still evolving and establishing themselves in the field. Their particular focus on such partners may reflect a vulnerability with being the (relatively) new kid on the block. This finding extends insight into the challenges of partnership capacity in general across the life stages of SFD organizations (Svensson et al., 2018), highlighting that sustained partnerships are of particular concern with newer ventures. Our board has been, as I said before, very instrumental in developing new networks of support—providing events that are more attractive to the general public. We had, just the last spin-a-thon, [and] one of the [broadcaster] journalists was on. She came by and signed up and promoted it to her Twitter account. So we’re getting exposure. Once [volunteers] start to participate in our activities—and if [their workplace] has a community foundation or an engagement foundation, [the workplace will] want to support Basketball Buddies because they know their staff supports it with their time. Social capital for domestic SFD was described in the context of networking with potentially new partners (e.g., volunteers, funders), whose interest in SFD was characterized by trust in the organization and its personnel and reciprocity based on common values. This linking social capital (Doherty & Misener, 2008) appears to be manifested in the leveraging of resources within ever-widening networks. [It is] different depending on their reporting guidelines and how involved they are in terms of the actual operation of each program that they fund. [And] it’s always been really important for us to have good communication with our funders around targets and timelines. The findings reinforce several critical elements of external relationship capacity for domestic SFD, while the identification of social capital and further insight to sustained partnerships as critical for program continuity—and with apparent variation by program life cycle—further enhance the framework. The importance of continuity is repeated in this dimension, with a focus on sustaining relationships (and the resources that come with them) for program continuity that is critical to achieving social change. Four critical elements of infrastructure and process capacity were determined to impact the ability of domestic SFD organizations to achieve their goals. Interviewees identified: (a) information technology (IT), (b) effective communication, (c) facilities, and (d) formalization. We’ve been able to upgrade our fundraising data . . . [and] we got a stronger, more robust financial accounting system now. We’ve been able to set up remote access for the finance department, so they don’t always have to be in here, and now we’re looking at doing some things with our IT. The biggest advantage we have as an organization is the fact that we have the input of all of our volunteers. They are very, very involved in running the [Strong Runners Program] on a day-to-day basis. We have the input of those 35 to 40 team leaders and another 200 assistant coaches on a regular basis. Marilyn (Squash for Social Change) described the importance of effective communication with her volunteers and staff, suggesting, “that’s the short and sweet . . . small team—easier to communicate. We’re all on email. We have weekly meetings. We do our goal setting twice a year. We know where we’re headed.” Effective internal and external communication has been noted elsewhere in the SFD (Svensson & Hambrick, 2016; Svensson et al., 2017) and community sport contexts (Doherty et al., 2014; Wicker & Breuer, 2011) and is essential for “informing people and letting them know what is going on” (Doherty et al., 2014, p. 135S) and communicating and reinforcing shared values (Svensson et al., 2017). At our former youth centre . . . we had a three-bedroom apartment that we used for years . . . and we had another unit in another building where we ran the girls program when there was a need to have private space for them . . . [and] we’ve lost those sites. So right now, we’re operating out of a portable that [Community Housing] has made available to us because those buildings have been demolished. Eddy described their “challenges with space . . . we always have to find a space—a field, a gymnasium, whatever . . . those are challenges . . . [and] it just comes down to funding—our hands are tied in some respects. We’re limited. We just can’t do more.” Access to facilities was indicated as perhaps the most critical element for domestic SFD in this study and has also been noted in other SFD research (Sawrikar & Muir, 2010; Svensson et al., 2017; Welty Peachey et al., 2015) and in the community sport context as well (Doherty et al., 2014; Hanlon, Morris, & Nabbs, 2010; Wicker & Breuer, 2011). Very few of the organizations in the current study own their facilities, and access to venues is necessary to offer, and even coordinate, their SFD programs. In terms of policies and procedures and manuals, because we’re piggybacking off the [American program]—and they’ve been around for 20 years, so, they’ve given us our poetry and coaching manuals—soccer coaching manuals . . . [and] a book of hundreds of soccer activities that our coaches can use, and it has a lesson plan in there as well. Marilyn also described benefiting from following an umbrella organization, suggesting “we’re fortunate that our structure is based on an existing structure—a model that’s been successful for 20 years, and that’s great!” This approach to formalization warrants further examination, regarding the availability, uptake, and effectiveness of adopted and adapted policies and procedures. Further, relatively fewer organizations with more established domestic SFD programs indicated formalization as a critical element. This may be a function of being more evolved and thus less focused on ensuring policies and procedures are in place, a finding that appears to be consistent with other research that has identified infrastructure capacity in general as less of a concern to SFD organizations that are at more advanced life stages (Svensson et al., 2018). Each of the infrastructure capacity elements has been identified in previous SFD research and so the current study reinforces their inclusion on a framework of domestic SFD capacity. However, new insights around variation in formalization—according to self-generated or adopted guidelines and structure, and its relatively greater attention by organizations with newer SFD programs—advance our understanding of this particular element in the broader dimension of infrastructure capacity. Regarding planning and development capacity, three elements were indicated as critical to domestic SFD organizations. Interviewees identified: (a) strategic planning, (b) collaborative planning, and (c) awareness of risks and opportunities. We’re getting to the point now, where our board is getting a little bit more involved with strategic planning—creating goals and trying to get a safety net of revenue for us. I think we’re just kind of, honestly, we’re just getting to the point after four years, where we’re starting to create long-term planning goals. The importance and challenges of strategic planning have been noted across other contexts as well (Doherty et al., 2014; Svensson & Hambrick, 2016; Svensson et al., 2017; Wicker & Breuer, 2011). However, the current study further uncovered that strategic planning was indicated as a critical element by relatively more organizations with older, more established SFD programs. It may be that organizations with newer programs have not yet begun to embark on strategic planning or even made a commitment to it, with perhaps a greater focus on day-to-day operations of a relatively newer initiative. This finding contrasts that of Svensson et al. (2018), who found that planning capacity in general was most challenging for start-up SFD organizations. The variation may be a function of the specific consideration of strategic planning as just one element of planning capacity in the current study, allowing this nuanced difference to become apparent. It may also be a function of the focus here on life cycle of the program versus life stage of the organization (Svensson et al., 2018). We basically open the doors to everybody. We’ve had parents come in, [and] once in a while we have players come in and they’ve said “this’s what I see as a problem—but this’s what I think we can do better.” We actually try to sit and listen to them and try to enact [their suggestions]. We need to look at challenges, and we’re going to look at—should we stay in our same focus, doing the mentoring, or should we look at broadening our scope . . . [with] youth employment, providing training and resume support . . . and do we have the resources to do that? The environment changes very quickly . . . families are moving in—moving out. Housing is being ripped down, [and] your constituent base isn’t the same from month to month or year to year . . . [and] there’s lots of stuff we would like to do—want to do—or, have in our plan. [But] we can’t always resource everything we’d like to do. Threats to organizations’ (which in some cases seeking to grow) sustainability, were indicated as particular considerations for domestic SFD planning. Uncertainty can be reduced by increasing the amount of information available to organizations (Slack & Parent, 2006), and this seems to be the approach taken (or considered important) in the domestic SFD context through collaborative planning. The salience of risk management in this context contrasts with CSOs that are concerned with creative outside-the-box thinking (Doherty et al., 2014, p. 136S), and may be a reflection of SFD organizations’ reliance on external and often new and changing funding partners. In the perhaps particularly dynamic environment of social change programming, organizations may be especially alert to mitigating risks to sustainability, particularly while seeking new opportunities for growth. The purpose of this study was to uncover the critical elements of organizational capacity for domestic SFD within the dimensions of human resources, finances, external relationships and networks, infrastructure and processes, and planning and development. Building on previous SFD research, the outcome is a refined framework of capacity (see Table 2) in this context, with insight into new and further nuances of elements that are critical to goal achievement. While this research makes a meaningful contribution in uncovering and further refining the critical capacity elements in domestic SFD organizations, there are limitations to this work. The study is based on responses from single persons from each participating organization. In future, research may include several perspectives, including from stakeholders, partners, and across levels of the organization to gain a richer insight to the nature and impacts of capacity in SFD organizations. Also, variation by program life cycle was considered in this study and some further insights to the relevance of critical elements of capacity in different subcontexts were observed. However, other bases of variation may be examined, such as organization size (according to budget, participants, paid staff (Svensson et al., 2018)), goals in terms of growth versus stability, and life stage (e.g., start-up, growth, mature, decline/turnaround (Svensson et al., 2018)), to further enhance understanding of capacity for domestic SFD. As Svensson et al. (2017) indicate, there may also be an opportunity to use more quantitative measures, including financial forms and other key performance indicators to assess organizational capacity rather than relying on leaders’ descriptions of strengths and challenges. Further, future researchers should explore connections between the identified critical capacity elements and SFD organizations’ outcomes, including general social change goal achievement and more specific indicators of that such as education retention and postsecondary enrollment, reduced violence, attitudinal change (with respect to gender and mental health issues), new immigrant and refugee integration, and improved relations between police and at-risk youth. Future research should also consider the role of leadership in SFD capacity. To date, and perhaps surprisingly, no capacity for SFD research has identified leadership as a critical element, perhaps because interviews have been conducted with leaders who may not have realized, or have been reluctant to identify, the importance of this factor. Leaders ultimately decide many of the key decisions regarding whether and how to build capacity for their organizations, and so it is of interest to further explore their role in organizational capacity for SFD. The framework of critical capacity elements may be a useful tool for domestic SFD organizations to assess their capacity strengths and challenges, determining what they are doing well, according to these factors, and identifying aspects that need attention. For example, SFD organizations—and especially those with newer programs—may reflect on whether they have volunteers and staff who are familiar with the development context of their programs and, if not, consider recruiting volunteers from their alumni network or other experienced individuals. SFD organizations may also reflect on the critical skills required to achieve their goals and seek out volunteers (and paid staff) who possess those skills. In particular, fundraising experience and grant writing skills may be especially important given these organizations’ reliance on external funding. Engaged and sustained partnerships were identified as critical to goal achievement, and devoting time to manage these relationships is important. Using a sound database to streamline communication to partners and participants appears to be helpful. The capacity for domestic SFD framework may also be useful to funding partners and policy makers. It can inform funding initiatives and (more) strategic initiatives directed toward supporting and building various capacity elements identified as critical by SFD organizations themselves. For example, financial support may be directed toward critical aspects including staffing and training, sustainable (long-term) finances, IT, and facilities. These are just some of the critical factors identified by domestic SFD personnel as fundamental to the ability of their organizations to deliver social change programs through sport. Thus, acknowledging the critical elements of capacity introduced and further verified in the current study as a framework for directing efforts to build capacity, domestic SFD organizations and their key stakeholders can be better positioned to support efforts toward sport for positive social change in their communities. Andersson, F. O., Faulk, L., & Stewart, A. J. (2016). Toward more targeted capacity building: Diagnosing capacity needs across organizational life stages. Voluntas, 27(6), 2860-2888. Brown, W. A., Andersson, F. O., & Jo, S. (2016). 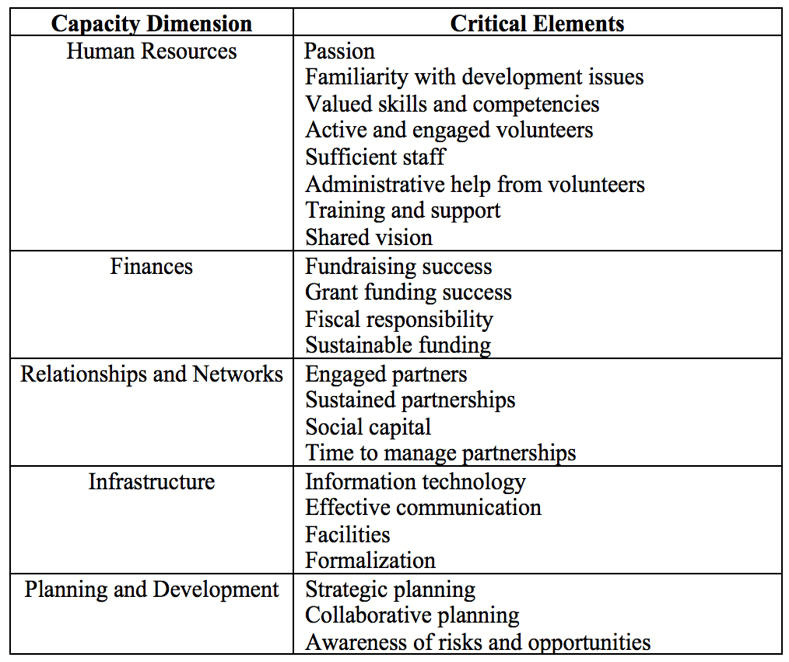 Dimensions of capacity in nonprofit human service organizations. Voluntas, 27(6), 2889-2912. Casey M. M., Payne, W. R., & Eime, R. M. (2012). Organizational readiness and capacity building strategies of sporting organizations to promote health. Sport Management Review, 15, 109-124. Chelladurai, P. (1987) Multidimensionality and multiple perspectives of organizational effectiveness. Journal of Sport Management, 1, 37-47. Coalter, F. (2010). The politics of sport-for-development: Limited focus programs and broad gauge problems? International Review for the Sociology of Sport, 45(3), 295-314. Doherty, A., & Misener, K. (2008). Community sport networks. In M. Nicholson & R. Hoye (Eds. ), Sport and social capital (pp. 113-141). New York: Butterworth-Heinemann. Doherty, A., Misener, K., & Cuskelly, G. (2014). Toward a multidimensional framework of capacity in community sport clubs. Nonprofit and Voluntary Sector Quarterly, 43(2S), 124S-142S. Gazley, B., & Abner, G. (2014). Evaluating a product donation program: Challenges for charitable capacity. Nonprofit Management & Leadership, 24(3), 337-355. Giulianotti, R. (2011). Sport, transnational peacemaking, and global civil society: Exploring the reflective discourses of “sport, development, and peace” project officials. Journal of Sport and Social Issues, 35(1), 50-71. Guest, A. M. (2009). The diffusion of development-through-sport: Analysing the history and practice of the Olympic Movement’s grassroots outreach to Africa. Sport in Society, 12(10), 1336-1352. Hall, M. H., Andrukow, A., Barr, C., Brock, K., de Wit, M., Embudeniya, D., … Vaillancourt, Y. (2003). The capacity to serve: A qualitative study of the challenges facing Canada’s nonprofit and voluntary organizations. Toronto, ON: Canadian Centre for Philanthropy. Hanlon, C., Morris, T., & Nabbs, S. (2010). Establishing a successful physical activity program to recruit and retain women. Sport Management Review, 13, 269-282. Hayhurst, L. M. C., & Frisby, W. (2010). Inevitable tensions: Swiss and Canadian sport for development NGO perspectives on partnerships with high performance sport. European Sport Management Quarterly, 10(1), 75-96. Horton, D., Alexaki, A., Bennett-Lartey, S., Noele Brice, K., Campilan, D., Carden F., … Watts, J. (2003). Evaluating capacity development: Experiences from research and development organizations around the world. Ottawa, ON. International Service for National Agricultural Research. Levermore, R., & Beacom, A. (2012). Reassessing sport-for-development: Moving beyond “mapping the territory.” International Journal of Sport Policy and Politics, 4(1), 125-137. MacIntosh, E., Arellano, A., & Forneris, T. (2016). Exploring the community and external-agency partnership in sport-for-development programming. European Sport Management Quarterly, 16(1), 38-57. MacIntosh, E., & Spence, K. (2012). An exploration of stakeholder values: In search of common ground within an international sport and development initiative. Sport Management Review, 15(4), 404-415. Meir, D. (2017). “Leadership and empowerment through sport”: The intentions, hopes, ambitions and reality of creating a sport-for-development organisation in Cape Town. Journal of Sport for Development, 5(8), 19-29. Misener, K., & Doherty, A. (2009). A case study of organizational capacity in nonprofit community sport. Journal of Sport Management, 23, 457-482. Patton, M. Q. (2015). Qualitative research & evaluation methods: Integrating theory and practice (4th edition). Washington; DC. SAGE Publications. Putnam, R. D. (2000). Bowling alone: America’s declining social capital. In Crothers, L., Lockhart, C., (Eds.) Culture and politics: A reader. New York: Palgrave Macmillan. Rosso, E. G. F., & McGrath, R. (2017). Community engagement and sport? Building capacity to increase opportunities for community-based sport and physical activity. Annals of Leisure Research, 20(3), 349-367. Sanders, B. (2016). An own goal in sport for development: Time to change the playing field. Journal of Sport for Development, 4(6), 1-5. Sawrikar, P., & Muir, K. (2010). The myth of a “fair go”: Barriers to sport and recreation participation among Indian and other ethnic minority women in Australia. Sport Management Review, 13, 355-367. Schulenkorf, N., & Edwards, D. (2012). Maximizing positive social impacts: Strategies for sustaining and leveraging the benefits of intercommunity sport events in divided societies. Journal of Sport Management, 26, 379-390. Schulenkorf, N. (2012). Sustainable community development through sport and events: A conceptual framework for sport-for-development projects. Sport Management Review, 15(1), 1-12. Schulenkorf, N. (2017). Managing sport-for-development: Reflections and outlook. Sport Management Review, 20, 243-251. Schulenkorf, N., Sherry, E., & Rowe, K. (2016). Sport for development: An integrated literature review. Journal of Sport Management, 30(1), 22-39. Sharpe, E. K. (2006). Resources at the grassroots of recreation: Organizational capacity and quality of experience in a community sport organization. Leisure Sciences, 28(4), 385-401. Sherry, E., Schulenkorf, N., & Chalip, L. (2015). Managing sport for social change: The state of play. Sport Management Review, 18(1), 1-5. Skinner, J., Zakus, D. H., & Cowell, J. (2008). Development through sport: Building social capital in disadvantaged communities. Sport Management Review, 11, 253-275. Slack, T., & Parent, M. M. (2006). Understanding sport organizations: The application of organization theory (2nd ed.) Windsor, Ontario, Canada: Human Kinetics. Spaaij, R. (2013). Cultural diversity in community sport: An ethnographic inquiry of Somali Australians’ experiences. Sport Management Review, 16, 29-40. Svensson, P. G., Andersson, F. O., & Faulk, L. (2018). A quantitative assessment of organizational capacity and organizational life stages in sport for development and peace. Journal of Sport Management, 32(3), 295-313. Svensson, P. G., & Hambrick, M. E. (2016). “Pick and choose our battles”: Understanding organizational capacity in a sport for development and peace organization. Sport Management Review, 19(2), 120-132. Svensson, P., Hancock, M. G., & Hums, M. A. (2017). Elements of capacity in youth development nonprofits: An exploratory study of urban sport for development and peace organizations. Voluntas, 28(5), 2053-2080. Svensson, P. G., & Seifried, C. S. (2017). Navigating plurality in hybrid organizing: The case of sport for development and peace entrepreneurs. Journal of Sport Management, 31, 176-190. Thomson, A., Darcy, S., & Pearce, S. (2010). Ganma theory and third-sector sport-development programs for Aboriginal and Torres Strait Islander youth: Implications for sports management. Sport Management Review, 13, 313-330. Wells, J. E., & Welty Peachey, J. (2016). Called to serve: Exploring servant leadership in the context of sport-for-development. Journal of Sport for Development, 4(7), 1-26. Welty Peachey, J., Borland, J., Lobpries, J., & Cohen, A. (2015). Managing impact: Leveraging sacred spaces and community celebration to maximize social capital at a sport-for-development event. Sport Management Review, 18, 86-98. Welty Peachey, J., & Burton, L. (2017). Servant leadership in sport for development and peace: A way forward. Quest, 69(1), 125-139. Welty Peachey, J., Cohen, A., Borland, J., & Lyras, A. (2013). Exploring the initial motivations of individuals to volunteer for a sport-for-homeless initiative. International Journal of Sport Management, 14(1), 103-122. Welty Peachey, J., Musser, A., & Shin N. R. (2017). Interrogating the motivations of sport for development and peace practitioners. International Review for the Sociology of Sport, 53(7), 1-21. Wicker, P., & Breuer, C. (2011). Scarcity of resources in German nonprofit sport clubs. Sport Management Review, 14(2), 188-201. Wicker, P., & Breuer, C. (2014). Exploring the organizational capacity and organizational problems of disability sport clubs in Germany using matched pairs analysis. Sport Management Review, 17(1), 23-34.